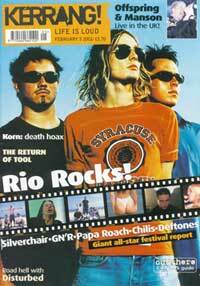 "The members of silverchair are each just 21 and have played precisely one concert in the last 12 months. Singer Daniel Johns looks like a star when he strides on in a jacket covered in tiny mirrors and launches into 'Israel's Son', but between songs he's a deer in the headlights, unable to think of anything coherent to say." "But if you think silverchair playing two spots up from the Deftones is incongruous, think again. During 'Anthem For The Year 2000', a multitude that matches the population of the boys' home city of Newcastle starts singing before Daniel does. 'Freak' inspires one of the biggest mass-pogo orgies in human history, and Australia's biggest resident rock star leaves his guitar wailing in front of his amp as he departs, leaving new songs 'Hollywood' and 'One Way Mule' hanging in the air."